"Directed by Oliver Award winner Steven Hoggett, performed by a young group of multi-talented musicians and led by the visionary composer and performer Kyle Riabko. 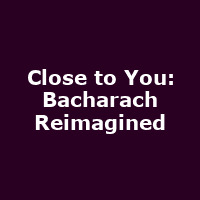 the show features thrillingly fresh yet beautifully faithful re-interpretations of Bacharach's classic songs. Fall in love with Bacharach all over again in a dynamic, uplifting and magical journey through over 30 classic hits including: Alfie, Anyone Who Had A Heart, I Say A Little Prayer, Walk On By, Raindrops Keep Falling On My Head, What's New Pussycat? And, of course, Close To You."